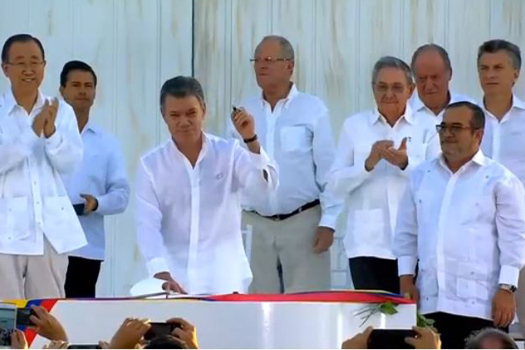 BOGOTÁ, September 26, 2016 — The International Center for Transitional Justice (ICTJ) welcomes the historic peace agreement signed today between the Colombian government and the Revolutionary Armed Forces of Colombia (FARC) – an essential step toward building lasting peace in the country. The Peace Agreement envisions the creation of several measures – including the “Victims’ Agreement” – which aims to fulfill victims’ right to justice, truth, reparations and guarantees of non-repetition. These measures are to be put into effect if the agreement is ratified in a national plebiscite, to be held on October 2, 2016. Implementing the agreement will require the participation and collaboration of all sectors of society across Colombia, representing the many different interests and demands of victims, affected communities, and stakeholders in Colombia. ICTJ has worked in Colombia for more than 10 years, focusing on strengthening national mechanisms for victims’ rights to truth, justice, and reparations. We are deeply grateful to the government of Sweden for its strong support and partnership since 2008, as well as for significant assistance from the Governments of Norway and The Netherlands and the European Union.